A voice-activated microwave is a terrible idea and a pointless frivolity, a device which solves a problem almost no one had. Why trust your lying eyes? Amazon's Basics microwave (with Alexa!) is no such bauble, and as silly a creation as it may appear, it's the company's cutthroat business as usual. Editor's Note: It's unlikely that we're going to see this product in Australia anytime soon. What I can almost guarantee — and what Amazon is most likely banking on — is that very few people will be buying Amazon's food reheating box because of its voice assistant integration: They'll be picking it for the price. At $US59.99 , it's cheaper than almost any other microwave on Amazon's marketplace. Is the company selling this device below cost to push out the competition, as it so successfully did in the books market? The manufacturing cost isn't apparent, nor something Amazon was willing to comment on, but clearly it's offered at a very competitive price — one that not only squeezes sellers already on the platform, but seems positioned to capture dollars that could have been destined for Walmart's coffers instead. Walmart's customers, research shows, earn less than Amazon's, though both companies are vying to expand their core demographics. The microwave works just fine without voice controls. It never needs to be a metal box you shout "ALEXA, REHEAT YESTERDAY'S PASTA" at through a connected smart speaker. 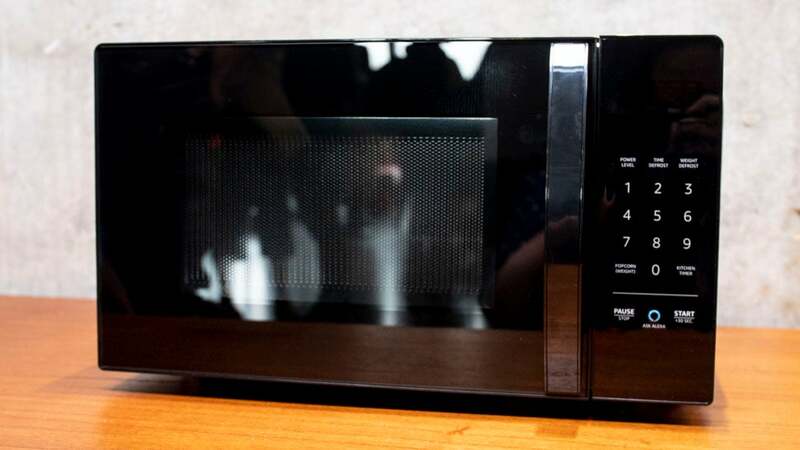 But once the Basics microwave is already bought ("It was pretty cheap, and the reviews were good! "), there's considerably less friction to invest in an Alexa-powered speaker. Other smart home systems — the Philips Hue, Nest, or even the Ring smart doorbell (bought by Amazon for $US1 ($1) billion) — cost anywhere from $US80 ($110) to several hundred bucks. But weighed against the $US50 ($69) Echo Dot, this unbelievably cheap microwave still costs more. The consumer arithmetic starts to look like a no-brainer — if a constant level of home surveillance doesn't make you a bit queasy. I don't mean to suggest that the AmazonBasics microwave is a good thing for, uh, the microwave industry (??) or the state of Amazon's stranglehold on ecommerce. Just that what on its face is a farcical creation is a remarkably considered, diabolical play on the part of a company known for being considered and diabolical. Speaking of: If you sign up for Amazon's Store Card — a credit card with a 27.74 per cent APR, in case you're keeping score at home — the microwave is essentially free, locking you further into the company's data and finance ecosystems. Did I mention the popcorn function is linked to a Dash button that reorders popcorn? Can we begin to see "frictionless" as synonymous with "helping part people faster from their hard-earned money"? Homeware essentials may not be a glamorous category to own, nor the most obvious to integrate with a voice assistant, but as long as Amazon wins on price it's all part of the long game. With wages stagnant, most consumers won't think twice about helping them win it, too, when it means a small savings in the short term. As to what the plan is for that goddamn clock, that's anyone's best guess.